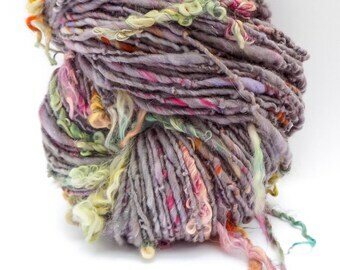 Spinning Fiber, Handspun Yarn, and Artistic Wearables. Announcement FluffduJour is based in the New River Valley, just outside of Blacksburg, VA. Offering unique spinning fibers, handspun yarns, and ready to wear items. Sources include locally sourced wool. Available for trunk shows and wholesale, message for details. FluffduJour is based in the New River Valley, just outside of Blacksburg, VA. Offering unique spinning fibers, handspun yarns, and ready to wear items. Sources include locally sourced wool. Available for trunk shows and wholesale, message for details. OH MY WORD!!! So beautiful & SOOOO SOFT!!! Can’t wait for my MIL to make a scarf for me!!! Seriously delicious looking!! Can’t wait to see what my MIL will make for me from it!!! Lovely lovely lovely. Thank you! Hues & textures in this are blowing my mind. I love it! Thank you! Big beauty of a handspun! Thank you so much! This scarf is beyond beautiful! I generally go for black and more neutral colors but I had to have this cowl scarf. It is radiant! Handspun Cowl Scarf Softest fibers, super colorful. GORGEOUS yarns, I am so thrilled. I will be back for more! Thank you! Slowly but surely getting the shop refilled! This skein is so huge I considered breaking it in half. But maybe someone would like it for a giant project! A nice quiet place to spin. Pulling a batt off the drum carder. 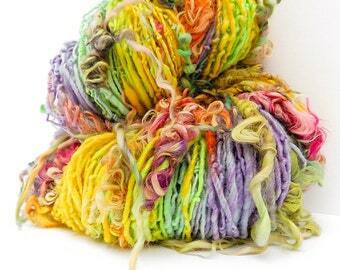 Serving fresh hand spun yarns and fibers. I've been sewing, and knitting since I was a little girl playing on the floor of my moms sewing room. She's the one who introduced the crafts to me. I kept with it through the years, picking up new crafts and looking for ways to expand on what I knew. We have an amazing resource with the Internet. You can learn anything you want. It just takes time, and dedication and a bit of $. I fill my shop with the results of my therapy. This is a way for me to relax, explore, and indulge my need for creativity. If I can share it with someone else who likes it, even better. Thanks for looking! I try to describe and post accurate photos. Please note that your monitor may display slightly different from actual colors. If you feel that the product you receive does not match what you thought you were getting I will give a refund but the buyer is responsible for return shipping and must be sent back in original condition. I accept Paypal and etsy pay, also etsy gift cards.Please complete purchase within 48 hours. I ship via first class for best deal on shipping. If you want it faster I can calculate the cost, priority is usually 5.60 for my sized packages.